story by Lauren Mandel Scanning the puddled, coal tar roof of the SHARE Food Program’s distribution center in North Philadelphia, it’s hard to imagine the expansive space as an active farm. The warehouse sits at the highly trafficked corner of Henry and West Hunting Park Avenues, amidst a tangle of power lines, abandoned buildings and the decommissioned Tastykake factory. But if you were to add a row farm, raised beds and a few greenhouses to the roof, the view might not seem so bad. Down on the ground, Philadelphians are enthusiastic about urban agriculture. With a healthy crop of community organizers, food justice advocates and young farming professionals, the city has quickly become a national leader in metropolitan food production. Local trendsetters continue to use diverse urban agricultural techniques, applying them to vacant lots, community garden plots, backyards and balconies. But what about rooftops? Rooftop farming is nothing new. Some historians believe the practice dates back to 600 B.C.E., when inhabitants of the Hanging Gardens of Babylon (in present-day Iraq) raised produce and fish on the building’s rooftop. Singapore now leads the global rooftop agriculture movement, mostly a result of the government’s commitment to food localization. By comparison, rooftop agriculture is just beginning to take root in the U.S. Brooklyn currently leads the nation in rooftop food production, but the trend has also sprouted up in Chicago, San Francisco and Portland. So, where does Philadelphia fit into this growing metro-agrarian scene? Local groups, like the Philadelphia Rooftop Farm and Cloud 9 Rooftop Farm, have been instrumental in raising awareness and excitement about rooftop food production through discussion and the development of pilot projects. These groups have yet to produce a commercial-scale rooftop farm, although this could soon change thanks to SHARE. SHARE’s 180,000 square-foot facility currently serves more than 500 local food cupboards. The nonprofit, founded in 1986, works to increase food access by providing affordable food packages. Steveanna Wynn, the current executive director, took over SHARE in 1989, and brought on environmentalist and urban farmer Bill Shick in 2010 to establish the facility’s on-site farm, Nice Roots Farm. In less than two years, the production area has blossomed into a community hub for neighborhood volunteers and urban agricultural enthusiasts from around the city. “The farm raises more than 20 crop varieties each season,” says Shick, “the most popular of which are collards, mustard greens and sweet potatoes.” Nice Roots Farm is primarily grant-funded, which enables Shick to sell his chemical-free produce practically at cost to customers from all socioeconomic backgrounds. Many community members did not have regular access to affordable, local produce prior to the farm’s establishment, explains Shick, which makes the demand for his urban vegetables high. Nice Roots isn’t the only agricultural success at SHARE. Urban apiarist Trey Flemming maintains 32 hives at seven locations throughout the city, 14 of which are on SHARE’s warehouse roof. The urban bees feed on diverse flora found in street plantings, parks, roof gardens and vegetable gardens. Compared with rural agricultural crops, these small-scale polycultures are generally not treated with herbicides or pesticides, which means the pollinators don’t bring chemicals back to the hive. For these bees, SHARE provides an invaluable resource: real estate. The success of Nice Roots and the rooftop apiary has Wynn and Shick eager to expand their agricultural operations. With the property virtually built to capacity, the only direction to expand is upward. In 2011, Wynn partnered with the Community Design Collaborative, a Philadelphia-based collective of design professionals that volunteer their services to assist nonprofits. The Design Collaborative was tasked with developing a master plan for the site, with rooftop farming as a key element. The Design Collaborative’s master plan proposes several types of agriculture for SHARE’s 3.5-acre roof, including row farming, raised beds and greenhouse hydroponics. These production areas are meant to prioritize high-value vegetable, herb and flower crops, as well as the honey already produced on-site. Morris Zimmerman, architect and the Design Collaborative’s team leader, explains that the plan also integrates extensive green roof areas and solar panels in locations where the building can’t structurally support a thick soil layer. 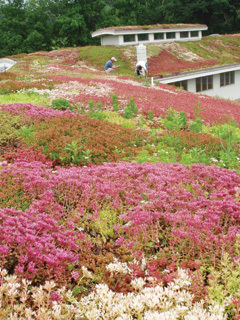 In order to ensure that the Design Collaborative’s rooftop vision was attainable, Zimmerman consulted with the Philadelphia-based green roof firm Roofmeadow, where I work. As Roofmeadow’s rooftop agriculture specialist, I worked with Zimmerman to develop soil depth, pricing, and phasing strategies for SHARE’s rooftop farm. For now the design is still in the conceptual phase, but the Design Collaborative’s efforts have begun stimulating funding interest. About $1 million is needed to repair the existing roof and waterproofing membrane, with an additional $1 million for the rooftop farm. Two million dollars may seem like a lot, but it’s a small price for the opportunity to embark on a new agricultural venture—one that builds community and supports food equity through the innovative design of underutilized space. Lauren Mandel, MLA is a project manager and rooftop agriculture specialist at Roofmeadow (formerly Roofscapes, Inc.), the Philadelphia-based green roof firm that consulted with Zimmerman on the SHARE project. Mandel is writing a series of books on rooftop agriculture, called Eat Up, and blogs regularly on the topic at eatupag.wordpress.com. To find out more about rooftop farming initiatives in Philadelphia, visit philadelphiarooftopfarm.wordpress.com and cloud9rooftopfarm.wordpress.com.